US Imperialism is endlessly interfering and interventing the democratic goverment of a Country. This shown by The US attempt to provoke interal affairs situation of Venezuelan goverment under the leadership of Nicolas Maduro who’s elected democratically to continuing Hugo Chaves’s anti-imperialism struggles. US Goverment labelling Maduro’s administration as violance to Human Rights and a Threat to National Security. 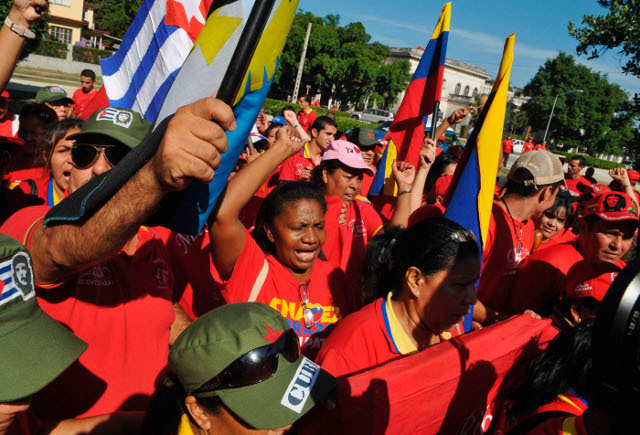 People and goverment of The Venezuelan have the sovereign right to self-determination. Venezuelan goverment also have the right to resisting US provocations that trying to taking over Venezuela by any tricky means to overthrowing Maduro and looking forward to developing its puppet regime in Venezuela. US Imperialism once again shows the effort to dominating the world by any means as rising the Democratics and Human Rights issues, War against Terrorist, aggression, or by undertake conspirations manner with local reactionary accomplices to gave birth to its puppet regime as occured in Venezuela these days.